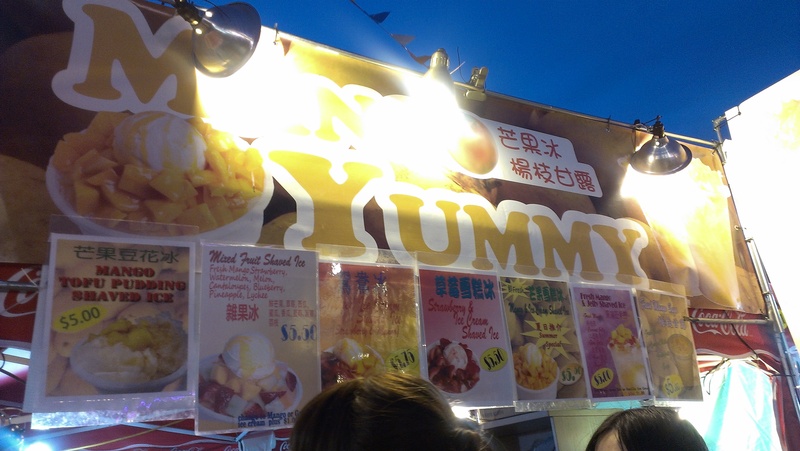 Last week I visited the Richmond Night Market on the second day it opened and there was a huge crowd. There was even a brief line up to get in too. This year their theme is Magical Duck Island. I was not aware that they had themes before but this one sounded pretty cute. Upon entering, everyone is presented with a Duck Duck Game Board and if you collect stamps of the same colour from different vendors you get to spin a wheel for a prize. 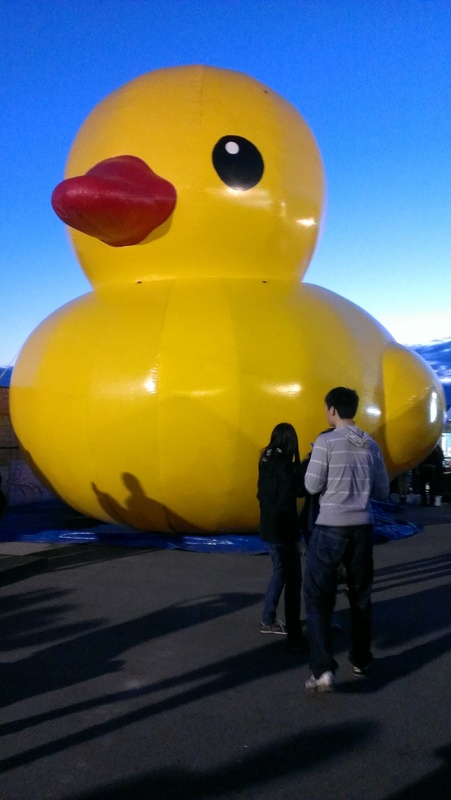 The new additions this year include a GIANT inflatable duck and a few carnival style game booths. They also have a Water Walkers attraction where people pay to run around on water in giant inflatable balls. However, most people end up falling 90% of the time. Obviously the only reason I was here was for the food. 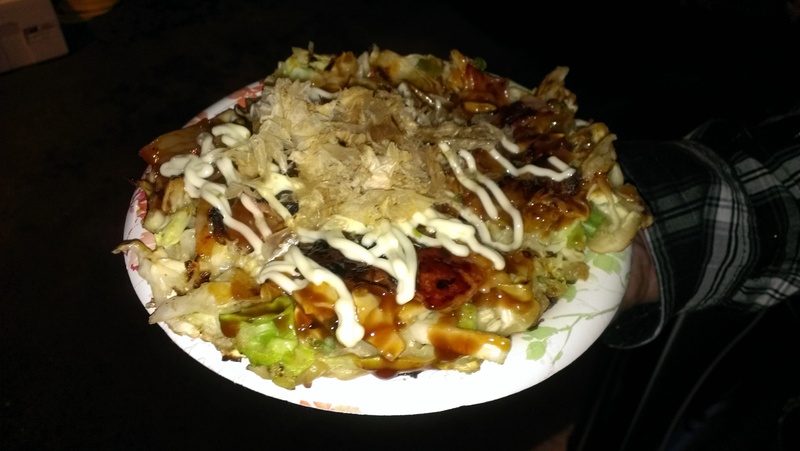 After struggling to walk by all the food stalls, I settled on getting okonomiyaki since they don’t sell it everywhere and I haven’t had it in a while. I chose the bacon and kimchi flavour and anxiously awaited for my food. It does take quite a while to cook and I waited at least 20 mins. It was worth the wait! I think this was pretty good for a night market stall. 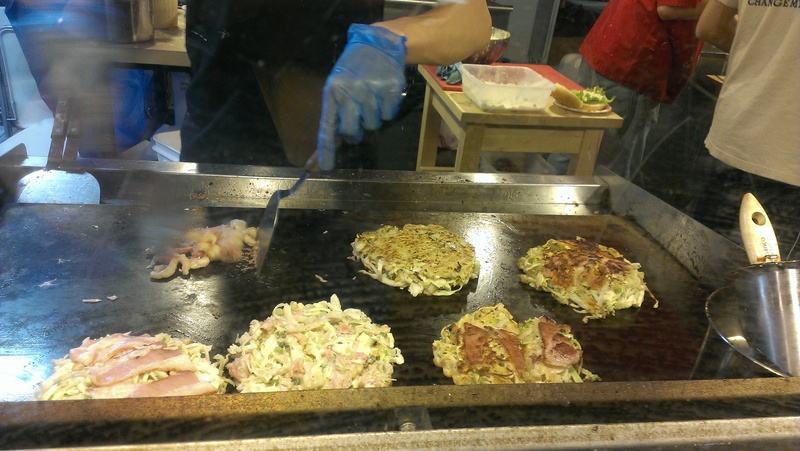 The batter wasn’t too thick and there was tons of cabbage and and enough bacon and kimchi. It didn’t fall apart easily either. All the okonomiyakis were also exactly the same size as the plate! A feat I wouldn’t be able to accomplish. I was super full after so you should probably share this with someone. As delicious as it was, next time I’ll try something that doesn’t take so long to cook! EDIT: Okay I’m just going to keep adding to this post about my other visits! This was a Fresh Mango and Jelly Shaved Ice. 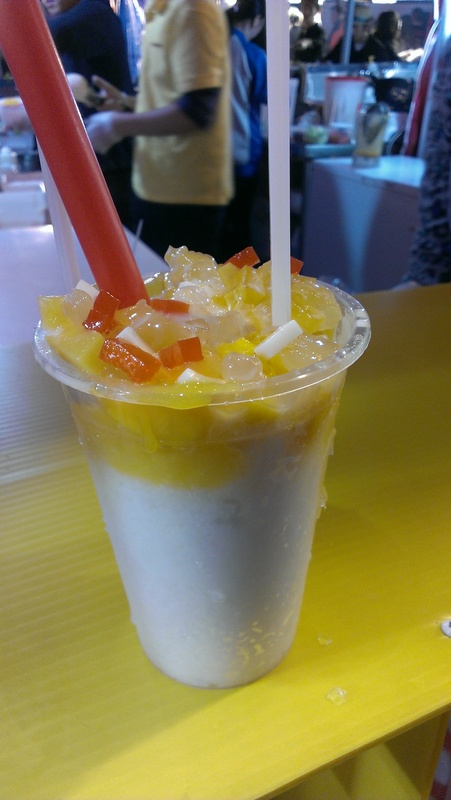 It also had tapioca and coconut milk that you can either drink with the straw or scoop with the spoon. I found this refreshing on a hot day and I love all the different textures this drink had from the jelly, mango and tapioca. 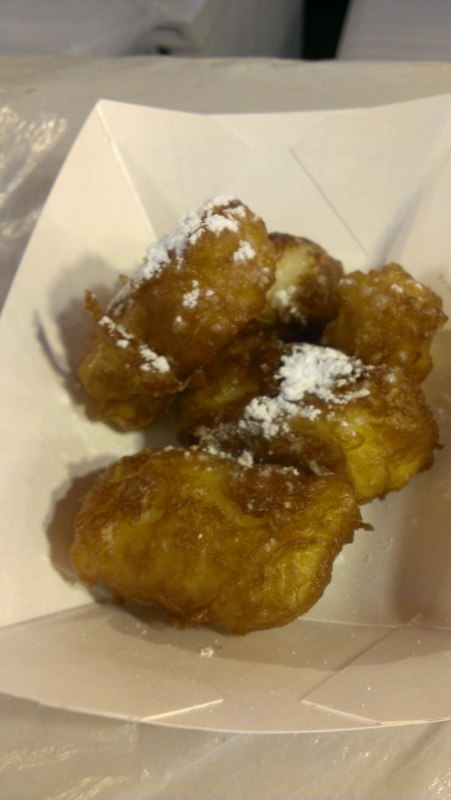 My friends and I also shared some Deep Fried Milk. If you’ve never had it before it might sound kind of weird. It tastes like a light custard that’s semi sweet and crispy on the outside. For $5 and five tiny pieces, this wasn’t really worth it to me. Finally this was my favourite! SQUID! Forgot which stall this was from but there are quite a few squid stalls. A small bowl costs $6.50 and you can choose between regular, garlic, hot and spicy or satay flavoured squid. We went for the satay flavour and it was really flavourful in a greasy way. 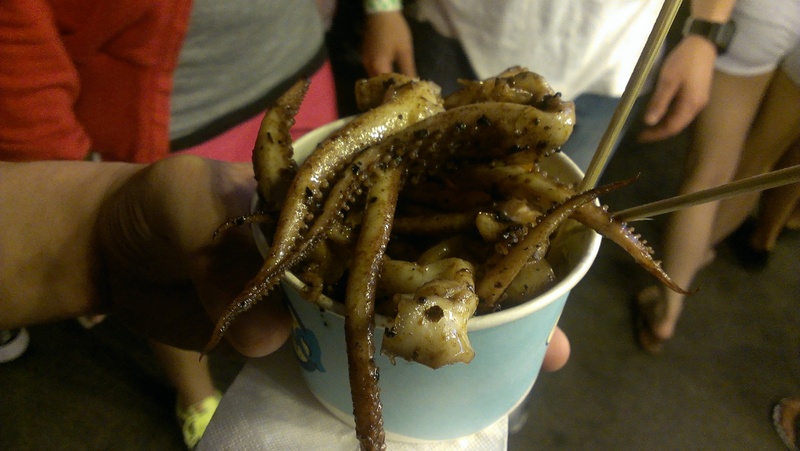 The texture of the squid was pretty good. It gave us something to chew on but it wasn’t rubbery either. 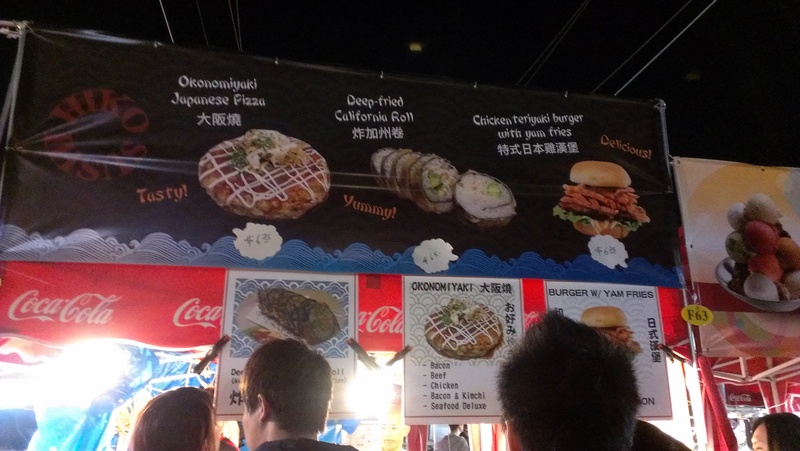 This entry was posted in Desserts, Fast Food, Food Reviews, Japanese and tagged okonomiyaki, Richmond Night Market.